An exclusive tour to Toledo and the windmills with hotel pick-up in Madrid city center and top lunch included. 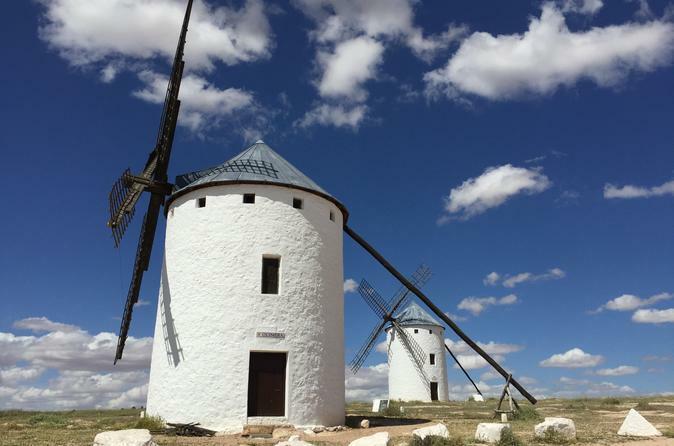 This tour gives you the opportunity to visit the famous glowing-white windmills featured in Don Quixote, a reputable winery and enjoy lunch either at a winery or a restaurant with an impressive atmosphere. You will be chauffeured onwards to Toledo´s city center where you will discover 2-3 historical monuments including its gothic cathedral and an outstanding lofty synagogue. Average group size is 4 with a maximum of 7 people. 3 amazing experiences in 1 day! Our carefully-devised, tailored itinerary goes above and beyond that of a typical tour from Madrid to Toledo. This tour, which includes hotel pick-up and drop-off in central Madrid, is suitable for groups of 2-7 people, will enable you to grasp a true feel for Toledo and La Mancha´s dainty gastronomy and finely produced wine (La Mancha is in-fact the largest wine region in the world). You will gain first-hand knowledge from the visits and will be accompanied by a highly proficient guide. Everything begins in an open-green, deserted field in La Mancha where you will visit the famous Don Quixote windmills and have a look inside (depending on the day). You will then be chauffeured to a prestigious winery where you will see for yourself the production of their award-winning, exceptional wines followed by a tasting session (guided by wine expert or the owner of the winery). The special part of this tour comes next. You will be served a scrumptious, traditional lunch at either a cave restaurant or at the prominent winery with its famous wines. The traditional dishes will arouse your taste buds and give you an unforgettable experience of La Mancha´s cuisine. Following your afternoon meal, you will enjoy a drive around Toledo for an eye-catching panoramic view of the city including its tranquil river, from the comfort of your luxury minivan. You will walk to the old town which truly is a melting pot of all three cultures: Catholic, Muslim and Hebrew. Included in this tour is the entrance for a stunning synagogue and cathedral in the heart of Toledo. Please note that depending on the season the order of the day´s itinerary could change.